The visit was the first since the Oslo Accords were signed. 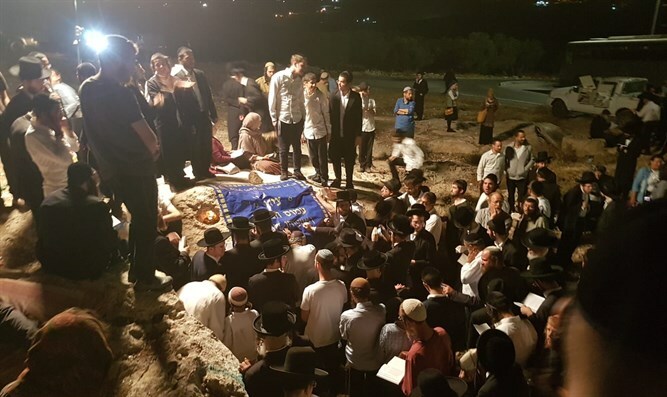 Following intensive IDF preparation, some 300 worshipers entered the tomb accompanied by the Etzion Brigade Commander Colonel David Shapira, along with Border Police and soldiers from the IDF's Civil Administration. During their tour, the worshipers entered the western town of Tekoa, where the ancient cave is located. From there the worshipers continued to the village of Halhul where, according to tradition, Gad the Prophet was buried. "The heritage is rooted in every corner of Gush Etzion, our connection to the place begins at the time of the Bible, when the prophet Amos and the prophet Isaiah lived here," said Gush Etzion Regional Council head Shlomo Ne'eman, who joined the tour. "After 1,950 years, the Jewish people continue to revive our heritage and roots in the Land of Israel and in Gush Etzion. This tour is part of a growing trend of many Jews who come and seek their connection to their ancestors and tradition," Ne'eman added. Major Yair Cohen said that the evening was a success and thanked residents for coordinating with the military. "Thanks to the full coordination and cooperation between the organizers and the bodies, the prayer was held successfully, and the soldiers who participated in the security of the visit will continue to protect the residents and visitors in the area," he said.